LONDON, Mar 21 2018 (IPS) - For the past weeks, many have been anxiously tracking the approach of Cape Town’s Day Zero: the day its taps will run dry. To everyone’s relief, current predictions are that careful conservation may stave off such a catastrophe in the coastal South African city until the rains arrive. It is not nearly often enough that a water crisis makes headlines around the world. The Mozambican capital of Maputo, home to nearly 1.2 million people, is facing a severe drought and water shortage that, despite the urgency, has received little attention. A new WaterAid report, The Water Gap: The State of the World’s Water 2018, reveals that more than 60 percent of the world’s population lives in areas where the water supply does not, or will not, consistently meet demand. There are 844 million people struggling to access what everyone needs most to live: water. Uganda, Niger, Mozambique, India and Pakistan are among the countries where the highest percentages or largest numbers of people cannot get clean water within a half hour trip. This means millions of people with long walks for water, which is often dirty and likely to make them ill. The report also shows disturbing new data on the often-sizeable gap between rich and poor when it comes to access to water, demonstrating that even those countries making progress are leaving the poorest behind. The least powerful, such as those who are older, ill, or disabled, are most affected because they may be more susceptible to illness and infections from the use of dirty water, with potential fatal consequences. 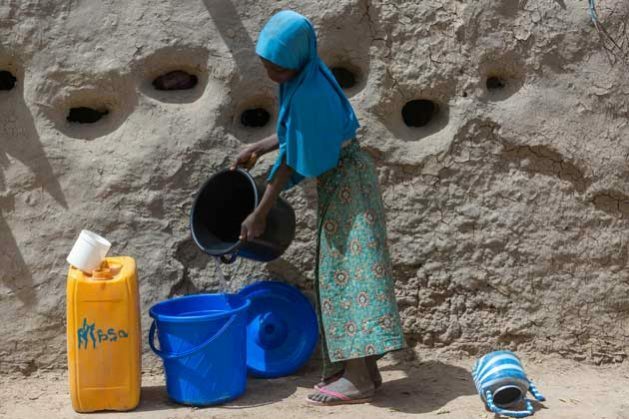 This inequality impacts women and girls more, because they bear the brunt of water fetching responsibilities. Think about this: the UN-recommended amount of water per person per day is 50 litres. If it takes 30 minutes round-trip to collect water from the nearest water source, that is two and a half months a year to collect the minimum amount for a family of four – 75,000 litres. That is a lot of time during which young girls should study, and when adult women might be able to care for families or earn an income. First and foremost, political will and financing are critical in addressing the water crisis. This year, there is an opportunity to change that. Nearly three years ago, the United Nations adopted the Sustainable Development Goals and thus made a promise to end extreme poverty. This summer, world leaders will convene at the UN to review the progress made on Global Goal 6; to deliver water and decent toilets to everyone, everywhere by 2030. In this, however, the world is dramatically far behind. At the current pace, global access to clean water will happen only by 2066 and global access to decent toilets not until the next century. Meanwhile, nearly 300,000 children under five continue to die every year because of diarrhoea linked to dirty water, poor toilets and poor hygiene. If we don’t achieve the water goal, other Global Goals for progress in education, nutrition, health, equality and stability will most certainly fail too. Ending extreme poverty is impossible without universal access to clean water and decent toilets. But to make this kind of progress requires focus and political prioritisation – it does not happen by accident. So as world leaders prepare to meet later this year it is an absolute priority that they move to provide water, sanitation and hygiene to everyone, everywhere by 2030, regardless of social or economic standing.